Please note that breakfast is available at a reduced price of EUR 5 for children. A 2-minute walk from the Kurfürstendamm shopping street, this hotel in central Berlin offers free Wi-Fi and a 24-hour reception. Uhlandstraße Underground Station is a 4-minute walk away. Eden am Zoo provides rooms with wooden floors and large windows. All rooms have cable TV and a shower. Guests can enjoy a large breakfast buffet in the Eden’s bright breakfast room or outside on the terrace. The new breakfast concept features a wide range of yogurts and fruit salads etc. The lively bars and restaurants of Savigny Platz are just a 4-minute walk away. Berlin Zoo is an 8-minute walk or a quick bus ride from the Eden am Zoo. It offers transport links to all parts of the capital, including direct trains to the Schönefeld and Tegel Airports. 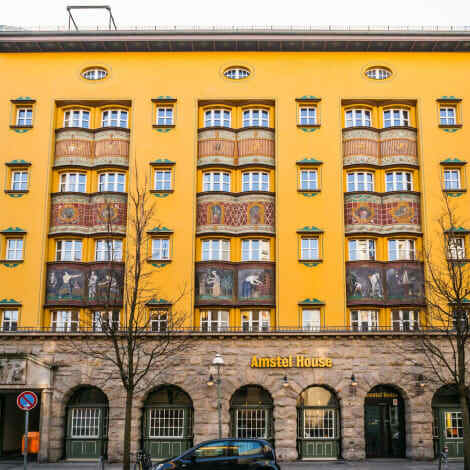 Located in Moabit, the 1-star Amstel House Hostel Berlin is in a prime spot for holidaymakers and business travellers alike. Just a short walk from the hostel you’ll find Berlin Zoo, Bellevue Palace and the famed shopping street Kurfürstendamm. The next U-Bahn station Turmstraße is a 5 minutes walk away. A ping pong table, billiards table and PlayStation are available for guests to use. The hostel also offers a laundry service and there’s a fully furnished communal kitchen. Complimentary wi-fi is provided in the lobby. This budget hotel in Berlin's Wedding district offers free Wi-Fi and great transport links. The Kurfürstendamm shopping street is 15 minutes away by underground. The privately run Steps-Hotel has rooms and apartments with modern, functional furniture. A small beer garden is located in the courtyard. Free Wi-Fi is available in the entire hotel. The reception and bar are open 24 hours a day. The Nauener Platz and Seestraße U-Bahn (underground) stations are 5-10 minutes away on foot. They offer direct links to sights including Checkpoint Charlie. This guest house offers single, double and family rooms, free internet and free parking. It is located in the Steglitz district of Berlin, 700 metres from Lichterfelde West train station. Most rooms at the Hotel Pension Dahlem have a washbasin and shared bathroom facilities. Some double rooms have private bathrooms. Free wired internet access is provided in public areas. A rich breakfast buffet is served each morning and is included in the room rate. There is a choice of restaurants nearby serving German and international cuisine. Berlin's famous Brandenburg Gate is just a 20-minute train ride away.